Tell students that this is the fifth activity of their competition and the group that has the most number of complete base words will earn five points. Remind students which groups they are in. Have students sit with their groups. Have the students review the magazine for this module. They should focus on how heroin and cocaine affect the central nervous system. Have each group identify a vocabulary word used in this module. This word will be their “base word” for an acronym. Then have students come up with supporting words beginning with each letter in the base word. The words must directly relate to the base word. For example, if the base word is “COCAINE,” the supporting words could be Crack, Overdose, Craving, Anxiety, Insomnia, Nasal damage, and Edginess. 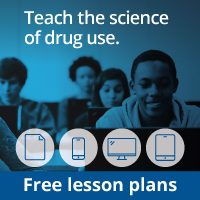 Point out that heroin depresses the central nervous system, while cocaine stimulates it. Both are extremely addictive. For each supporting word, students should write a sentence that describes its relationship with the base word (e.g., “Nasal damage is an effect of snorting cocaine.”). Give the students 10 - 15 minutes to complete their words. Tell them they will get one point for each supporting word they can come up with. You can either give students base words to complete or have them come up with the base words on their own. If the group is more advanced, have them complete several words. Students can use any word that pertains to something they’ve learned in the module, or even the curriculum so far. After each group has completed the word or set of words, have studentsshare them with the class. Record the winning group’s points on the Group Scorecard. Over the last 30 years, scientists have developed a large body of research documenting how cocaine and heroin affect the central nervous system and other body systems. Often this material is written in such a way that young people have a difficult time understanding it. Nonetheless, it is important that students have access to this information. During this activity, students will work together to interpret some recent research and put it into a format that their peers can understand. Ask each group to use the Web sites listed below or other related sites to deepen their understanding of the topic assigned to them. Have each group put its information into a poster that is simple and easy to understand that they will present to the class. If poster board is unavailable, have students create a brochure instead. After each group has completed a poster, have them present their poster to the class. Ask follow-up questions to reinforce important information.